Without doing a discourtesy to the place, probably one of the best bits of our stay in Vientiane was the trip there from Vang Vieng. It’s all about the journey, so they say. 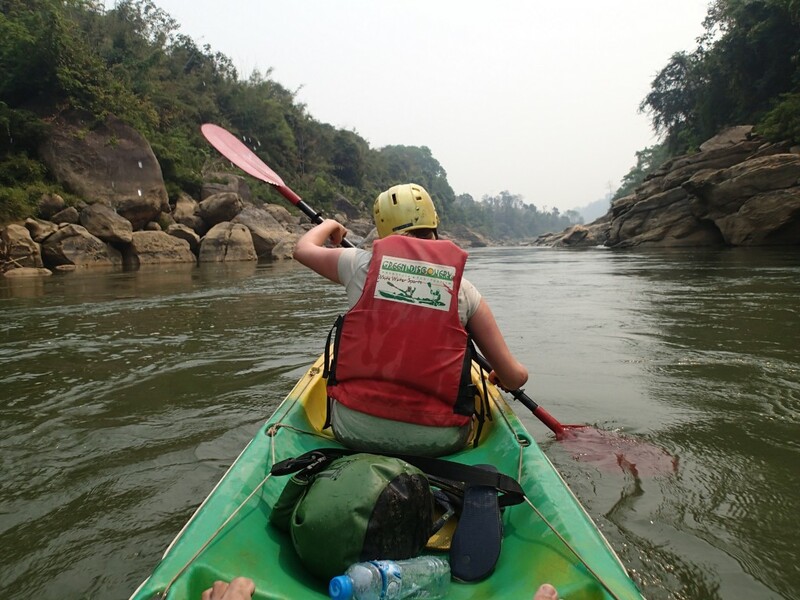 Having previously experienced just how puke-inducing (and fear-instilling) the zigzagging and steep mountainous roads of Laos can be, we decided to go for a slightly less-adrenaline fuelled route; the rolling rapids of the Nam Lik river – via canoe. 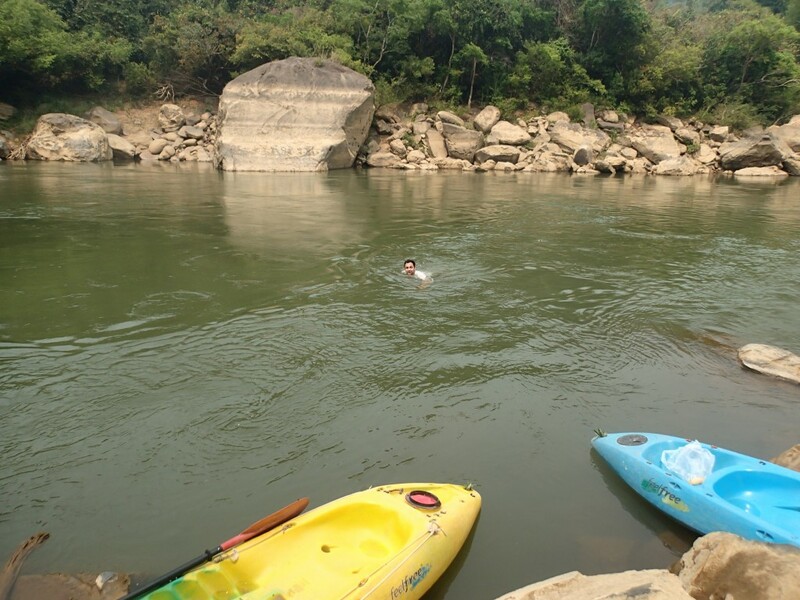 To be fair, at this time of year, the waters of the Nam Lik are less white-water and more meandering than the tumultuous whirlpools that can be experienced during the wet season, but we were still prepared to get a bit wet. We turned out to be the only people booked on the trip so luckily had our lovely Lao guide, John, all to ourselves meaning that we got the full force of his attention when it came to crucial aspects of instruction, such as ‘how to conduct the best canoe-bound waterfight’ and ‘how to cool-off in the heat of the day’ (ie. Jump out of the canoe). After a fairly smooth start and just a few baby eddies that somehow managed to spin our canoe around (‘keep paddling Jen!’) it was time for the big one. John had us (me) in a flurry of nerves when he announced all of a sudden that we should take it easy in order to save our energy, as ‘the big rapids are only 500m away’. With a big gulp (me again) we rested our arms and slowly let ourselves drift to our inevitable doom (yes this is Jen writing here). And then we were upon it. 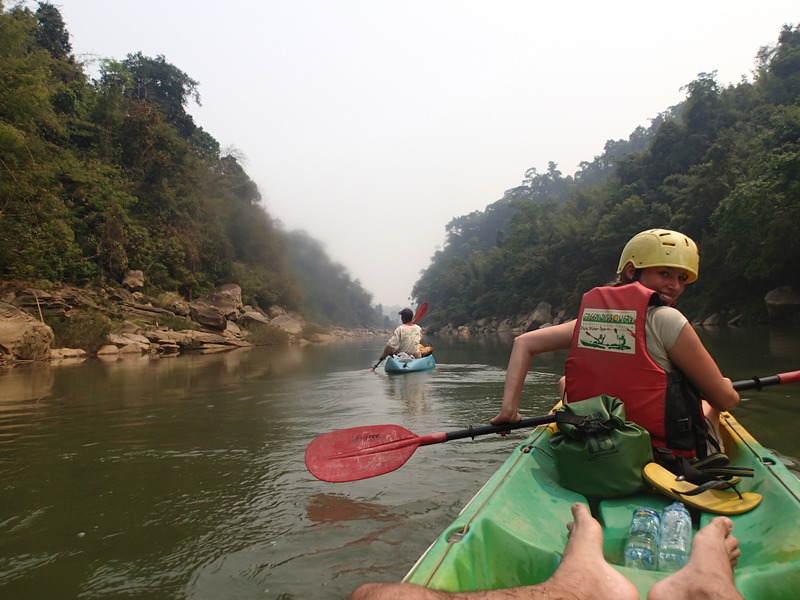 To my horror I realised the nose of our canoe was heading right for the precipitous edge of what looked like a huge drop; a waterfall no less than a foot – nay, TWO FEET! – high. Clinging on for dear life we straddled the beast (keep PADDLING Jen!) and – assailed on both sides by violent waves of water – we rocked and battered our way through, until we were spat out (rather gently) the other side. Grinning, John expressed his surprise at us not capsizing. Apparently most people do, you know. Nick pointing out the huge rapids. What do you mean, you can't see them? The afternoon kayaking was much less strenuous (a good thing as my left hand was slightly incapacitated – did I mention the bee sting?) and we were able to enjoy the beautiful scenery of the river a bit more. Water buffalo and exotic sounding birds lined the banks, and as we got closer to the village where we’d be mooring up these were replaced by groups of people, in the full throes of midday partying. It was International Women’s Day, which turns out to be a really, really big deal in Laos, celebrated by a National holiday and the all-day drinking of Beer Lao. 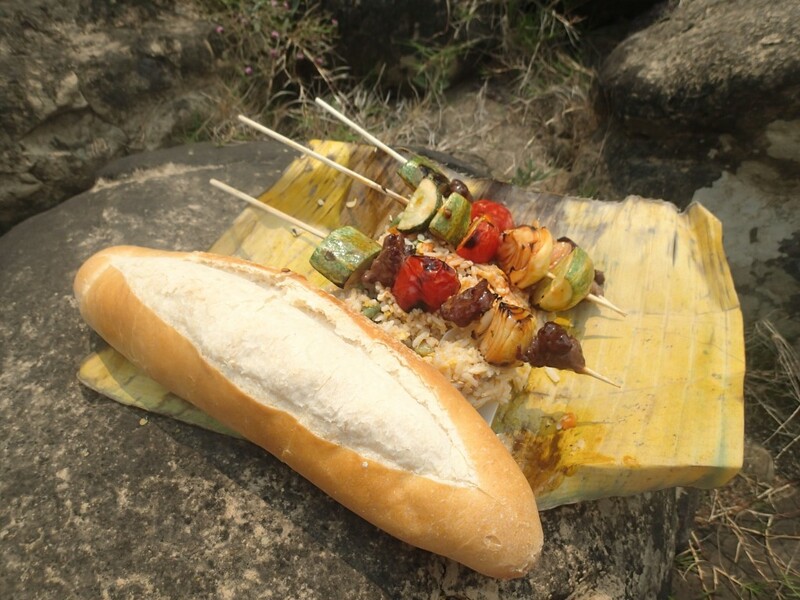 In fact, when our kayak trip sadly reached an end, we pulled up to the bank and were immediately beckoned over by a family having a picnic by the shore, who plied us with several glasses of Beer Lao in just the few short minutes that it took for our truck to arrive. Great country. 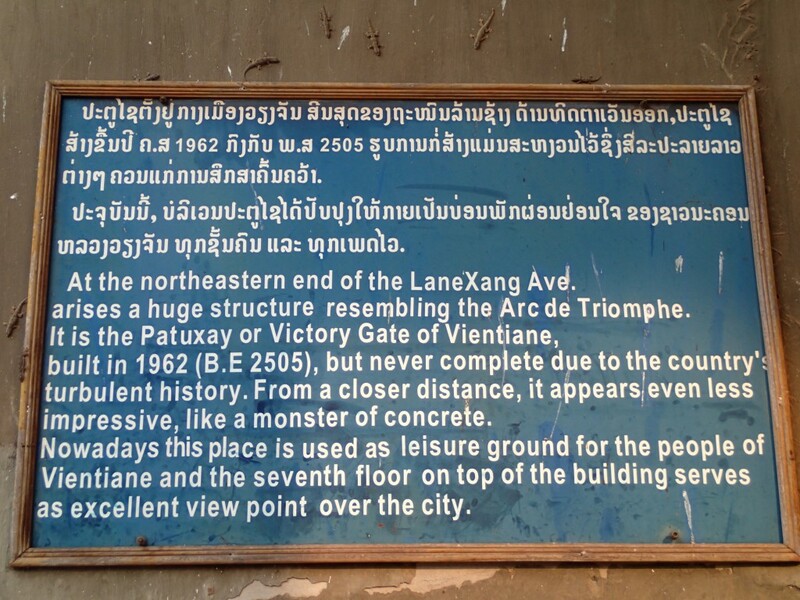 Our stay in Vientiane itself involved much less exertion. This was mainly down to the fact that from about 9 am in the morning it was so, so painfully hot (to our delicate British constitution anyway) that we couldn’t really do much. Secondary to that, there frankly isn’t that much to do in Vientiane. We were well placed where we were staying, just one street in either direction from the main tourist attractions of the (capital) city. These turned out to be a fountain and an Arch de Triomphe replica, the very plaque of which amazingly describes it as unimpressive. .... apparently not so impressive. 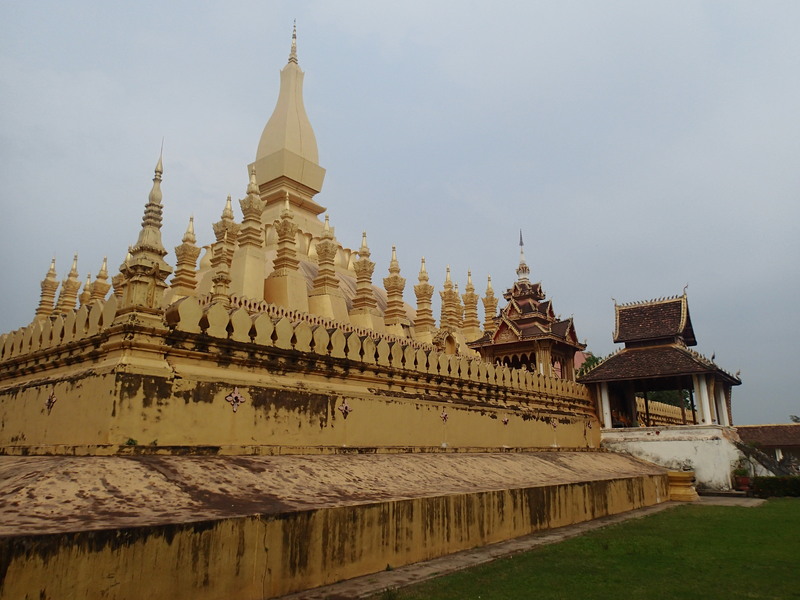 After we’d exhausted these delights we took a tuk tuk to ‘That Luang’, a golden stupa about 3 km from the city centre. It was a nice way to spend 20 mins, and enabled us to see a bit more of the city. Highlights of our stay included a relaxing and indulgent (but bargainous) massage, and a delicious curry. 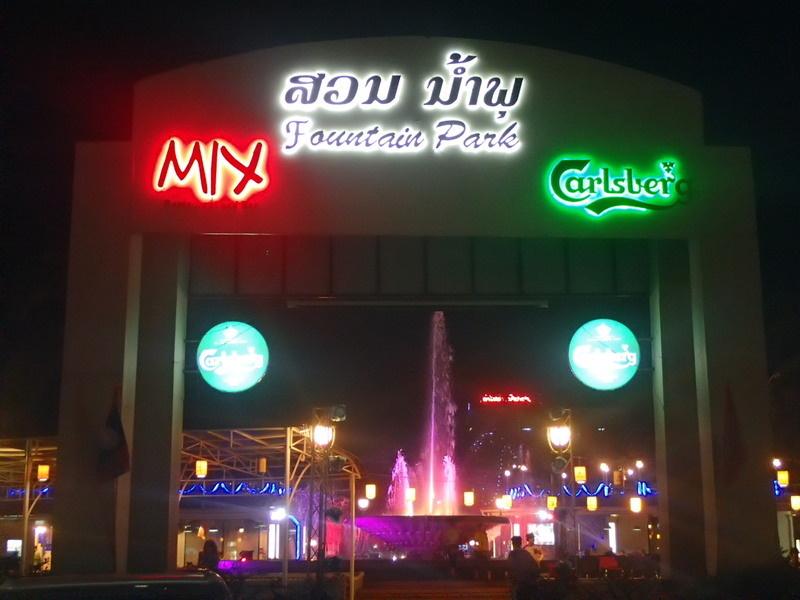 We also spent time (between 7 am and breakfast, and then again at night) walking along the Mekong, or at least alongside the road that is about 100m from the Mekong which is currently very low, and taking in the night market and riverside bars along there. 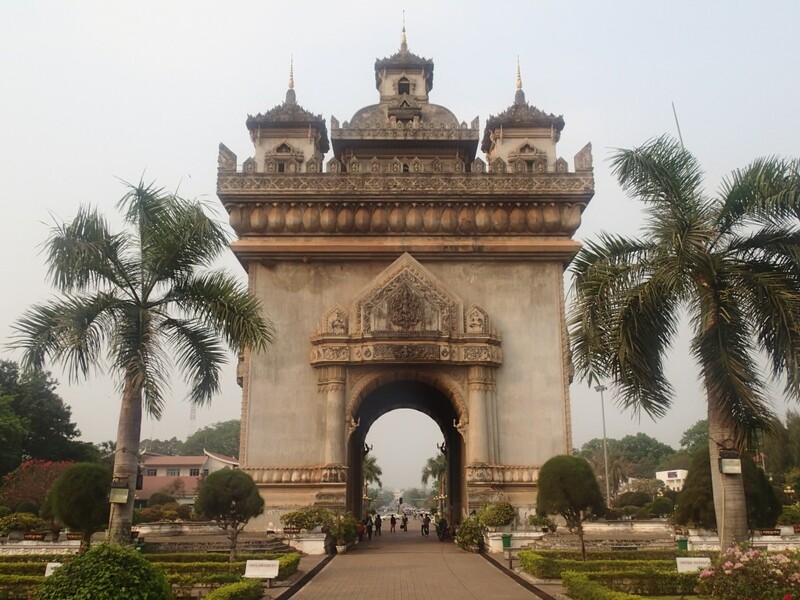 Lonely Planet bigs up Vientiane as an up-and-coming city of culture, full of tree-lined boulevards and boutique coffee houses. Whilst this may be true, some of the romanticism is lost in the reality; there are indeed trees on the pavements and there are lots of coffee shops, but it doesn’t get much more exciting than that. What we did find in Vientiane was a genuine city busy with locals going about their everyday business. 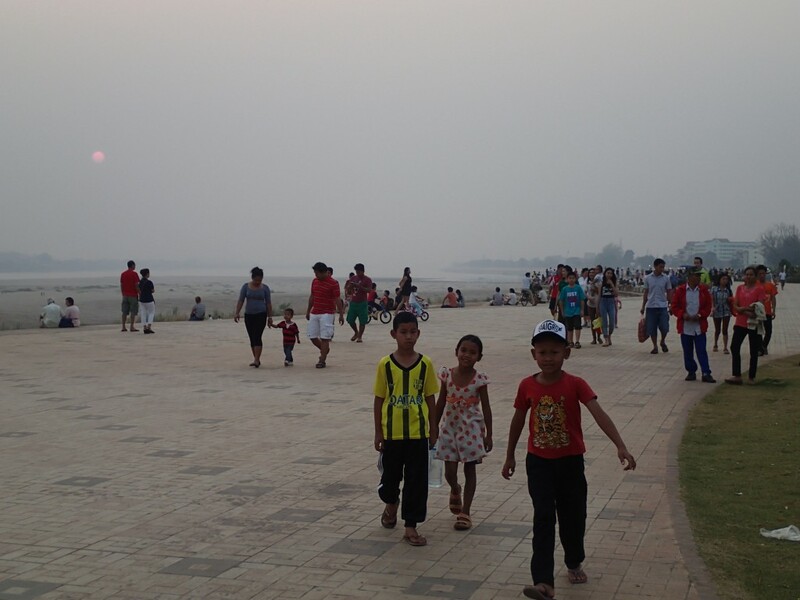 One of the best moments was the hour spent walking along the river at sundown (although the sun couldn’t be seen through the fog) as it was the time when the crowds of local people came out to do the very same – walk, socialise, exercise (riverside Zumba anyone?) and fly remote-controlled planes (amazing!). 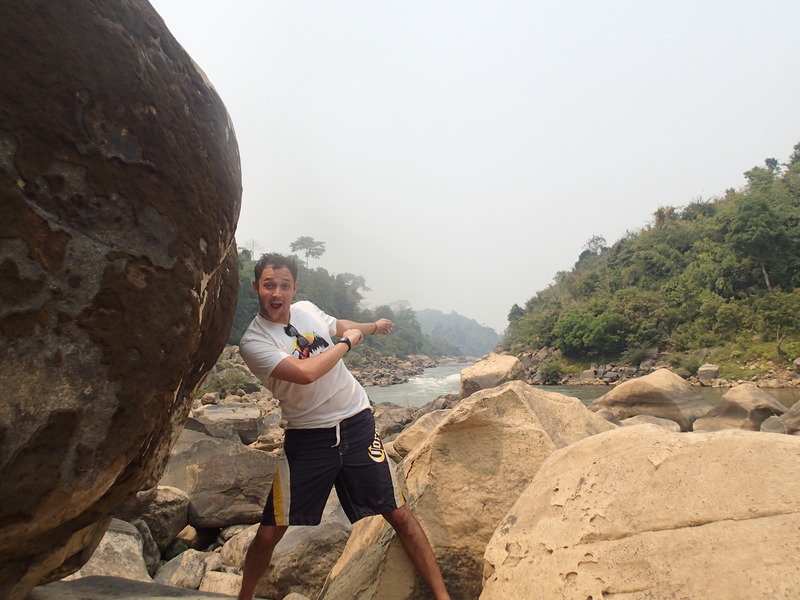 Having spent time in the (admittedly lovely) Luang Prabang and (definitely not lovely) Vang Vieng, it was refreshing to be somewhere that hasn’t changed its identity by bending over backwards for tourists. Long may it continue just as it is – we just might not go back any time soon. NEXT TIME: Hanoi – just like Paris, much cheaper. BREAKING BAD UPDATE: Series 4, episode 6.